This is the story of how Dr Dre went from high school drop-out to the richest man in hip-hop. From his solo career, to signing Eminem and Snoop Dogg and finally, the megabucks money he's made with Beats. 1. The first step on Dre's journey to earning his riches was to drop out of school. We're not encouraging it kids, but after continuously scoring bad grades Dr Dre – real name Andre Romelle Young – dropped out of school to become a club DJ. It was a move that, as we now know, didn't end too sadly for him. 3. The forming of Death Row Records. That same year (1991) Dr Dre co-formed his own record company called 'Death Row Records.' Now an entrepreneur as well as producer and rapper, Dre was responsible for finding some of hip-hops biggest players in the 90's, including Tupac Shakur. It's an album that needs no introduction. It went multi-platinum in under a year and over a decade after its release 'The Chronic' is still making Dre money. It has been re-released three times and has singles featured in best-selling video game Grand Theft Auto: San Andreas. 5. Finding a protégé in Snoop Dogg. While at Death Row Records Dr Dre also found a protégé in Snoop Dogg, introducing him to the world of hip-hop through features on The Chronic and producing his debut album 'Dogglestyle,' which became the first debut album for an artist to debut at number one on the Billboard 200 album charts. We don't doubt that it earnt Dre a few bob. 6. In 1996 Dre left Death Row and started Aftermath Records. Aftermath entertainment operated as a subsidiary of, and was distributed through, Universal Music Group's Interscope Records. It's the label that has homed acts including 50 Cent, Eminem and Kendrick Lamar. 8. Dre loved music, but he saw it as a business as much as a passion. Dre co-produced the fastest selling rap album of all time, Eminem's 'The Real Slim Shady.' He was good at his job because he was passionate about music – he once claimed he spent 79 hours straight in the studio, but Dre also made clear that music is about business more than anything for him, saying;"Once it comes out, for me, it's just business. Numbers." 9. In 2001 Dre reportedly earned $35 million from one sale. Dr Dre sold 30% of his share of his Aftermath label to Interscope records in 2001, a deal that earned him a huge $35 million. 11. How much does Dr Dre earn for every song he produces? 12. So what does Dr Dre charge to produce a song if you aren't signed to Aftermath? Rolling Stone reported: "For outside projects such as the Gwen Stefani/Eve collaboration 'Rich Girl,' seeing the Doctor is expensive: Dre earns roughly $250,000 per track." 13. But we all know it isn't music that's made Dre the big bucks. 14. In 2012 Dre sold HTC 51% of the company for $300 million. When smartphone company HTC paid $300 million for a 51% stake in Beats Electronics, Dre took home $100 million pretax. The deal meant that Dre went to the top of Forbes highest paid hip-hop musicians list in 2012. Later on Dre and his partners bought back half of what they had sold. 16. 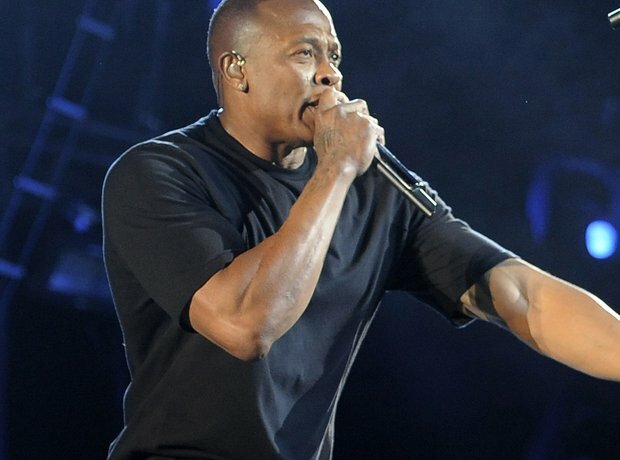 A year later, Dre moved back down to third place on Forbes hip-hop rich list. Diddy's deal with Ciroc meant he took the number one spot, and Jay Z came in at number two because of his Rocawear and Live Nation ventures. Dre was suddenly third on the list with a worth of $350 million. At $700 million Diddy kept his position as the richest person in hip-hop – and he wont be moving out of the top five any time soon as a deal with Diageo's Ciroc brings Diddy an eight-figure salary every year! But Dre did manage to overtake Hov, increasingly his worth to $550 million. Picture: Getty. 20. Dr Dre signs on the dotted line with Apple. It's official! Apple has acquired Beats Electronics for a staggering $3 billon. Forbes say they have done the math and Dre, the boy who dropped out of school, will be worth an estimated $800 million after the Apple acquisition. Not quite the 1 billion he claimed, but certainly enough to crown him (by a lofty $100 million) the richest man in hip-hop.